Credit Dave Muscato of American Atheists. The organization American Atheists is constructing what they say is the first Atheist monument on public property at the Bradford County Courthouse in Starke. Last year, a Christian group called Community Men’s Fellowship erected a five-foot tall depiction of the Ten Commandments outside the courthouse. 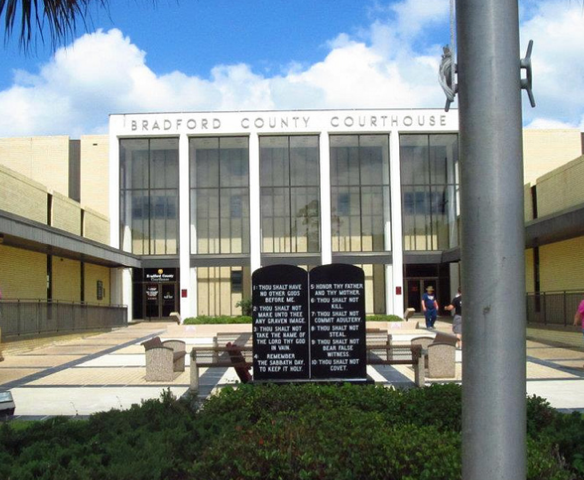 Then American Atheists, along with Daniel Cooney who lives in Starke, sued Bradford County saying it endorsed a religion. American Atheists is a national 501(c)(3) that focuses on atheist civil rights and the separation of church and state. Bradford County considered American Atheists’ case, and asked Community Men’s Fellowship to take down the six ton monument, but they refused. Community Men’s Fellowship threatened legal action if the monument was removed citing that would hinder free speech. At this point, the county was facing a legal action both if the monument remained or if it was removed. Dave Muscato, head of Public Relations at American Atheists says through court-ordered mediation all parties were able to reach a conclusion everyone could get behind. 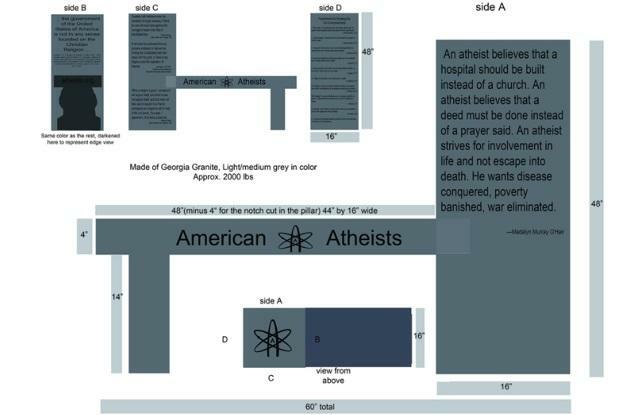 The decision was to grant permission to American Atheists to place a monument nearby in the courthouse square. The monument of the Ten Commandments stands in the courtyard of the Bradford County Courthouse in Starke, Florida. Credit Dave Muscato, American Atheists. Bradford County, home to about 63,000 people, established a free speech zone in 2011. The zone was intended to be a place where groups could place privately funded monuments. Representatives for Community Men’s Fellowship did not return calls from WJCT, but did have a statement on their Facebook page. The group thanked supporters and urged them to be accepting of the atheist monument. The unveiling is set to take place June 29th in Starke. American Atheists President David Silverman is set to deliver the dedication. The monument will feature quotes from Thomas Jefferson, Madalyn Murray O’Hair, Benjamin Franklin and others.